It’s not just Xcel, but they’re the ringleaders filing the request. So what is this and why support it? Well, first, let’s look at the basic plan — “stakeholders” and Xcel are proposing things be done differently. Why? Well, here’s an egregious example. How about circumventing all that pesky criteria that they must meet to get a Certificate of Need, and we know how hard that is to prove up need when there is none… so will someone tell me what the relationship is between “use of, and give additional weight to, settlement agreements among the parties” and criteria for a Commission on anything, be it a Certificate of Need or a Rate Case? Can you believe that? But wait, how many Certificate of Need applications have ever been denied? Oh well, maybe it makes them work at it too hard to fabricate some need claim? And we know how rate cases have been going lately, not exactly in a way that Xcel wants! Don’t want those pesky intervenors in individual cases, after all. Multiple dockets for multiple projects, how on earth could people receive notice, participate and find representation in this scenario? And how about not doing anything until they’ve addressed the 09-845 “Public Health Impacts of Wind Turbines” docket that’s been languishing for five years now? 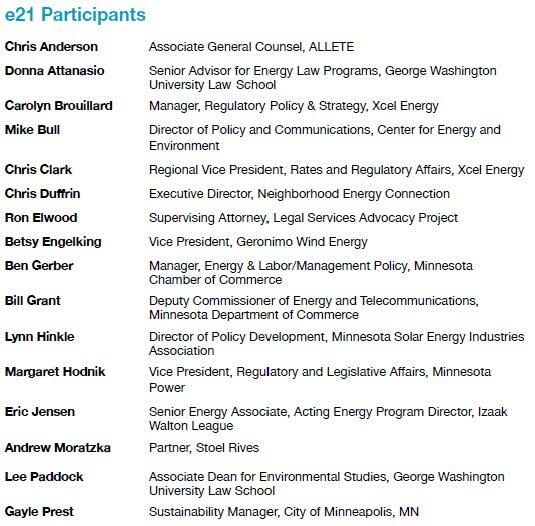 Note that not one of these “stakeholders” have bothered to join, participate, attend, or file comments on the PUC rulemaking for Minn. R. Ch. 7849 Certificate of Need and 7850 Site or Route Permt. None of them bothered to weigh in on the Office of Administrative Hearings Minn. R. Ch. 1400 and 1405 Rulemaking trial balloon either (it’s on hold, and comments have not been published and I had to file a FOIA Request to get the Comments of others). What is Gov. Dayton thinking? 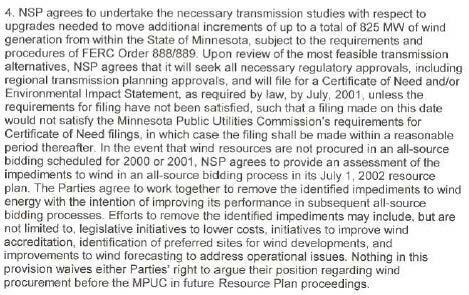 Who can forget the 01-1958 SW MN 345 kV 4 Certificates of Need docket, where parties, well, SOME parties, were actively encourage to “negotiate” by then ALJ and now PUC Chair Heydinger, and Crocker and Krikava were so busy winking at each other? Well, apparently not everything they wanted, because now they want more. We saw how promotion of transmission worked on this ITC Midwest MN/IA 345 kV case. And don’t forget, the Walton’s Bill Grant is now Deputy Commissioner of Commerce in charge of Energy permitting and “environmental review,” and the Walton’s Nancy Lange is now on the Public Utilities Commission. Wonder what kind of review their “e21 Initiative” will get! Where is the public interest in this? Here are materials sent by David Schultz after he was down here in Red Wing to speak about what it means to be on a nonprofit board, things to be aware of, basic ethics and responsibilities. Great turnout, and a lot of good, needed, information. MUCH appreciated, David! And here’s another column about misbehavior of nonprofit and lack of oversight by the nonprofit boards, and another fresh example in TIES, which has some pretty egregious expenditures and practices. It seems the Legislative Auditor is ramping up scrutiny and enforcement actions. YES! If any nominee to a nonprofit board doesn’t think she can be the one to ask questions like that, then she really ought to think about contributing in another way. Maybe sign up for some volunteer shifts or make a donation. Stay out of the boardroom. There’s no reason to consult a manual of best practices in nonprofit governance, if anyone’s even thought to write one. Being a fine board member just isn’t that hard. In the spectacular cases of nonprofit mismanagement in the news this year, such as with Community Action of Minneapolis, there wasn’t anything clever going on that would have needed any special skill to sniff out. How hard can it be, really, to figure out that lending more than $36,000 to the executive director to buy a car maybe isn’t a good idea? Melissa Stone, a professor of nonprofit management at the at the University of Minnesota, said she doesn’t much like the term best practices either, in part because serving on a nonprofit board can be such a different experience depending on the size of the organization or its mission. But when it comes to what she called “the basic legal responsibilities,” including financial oversight, the job is really the same whether you’re a trustee for a big hospital or a director for a community food shelf. That legal responsibility comes with terms that may sound technical the first time a person hears them, such as “duty of care.” All that really means in practice, though, is that the director puts in the effort to look after the best interests of the organization. That probably also means, of course, showing up on time when the board meets. “It’s really pretty hard to provide oversight if you don’t attend meetings,” Stone said, observing that many nonprofits don’t have an attendance requirement in their bylaws. The recent scandals may give the impression that the nonprofit community is out of control, but the basic financial oversight of nonprofits seems to be improving. Many more nonprofit boards, for example, have a formal conflict of interest policy than was the case 10 years ago. The reality for a lot of nonprofits, particularly smaller ones, is that keeping a full complement of board members isn’t easy, let along recruiting enough legal and financial experts. There’s no reason to be concerned, though, because a board mostly made up of well-intentioned financial novices can be plenty effective at basic oversight. They just need some encouragement, from the nominating committee, the board chair or the executive director. There’s no reason for a new director to be embarrassed about having to ask why a not-for-profit has to file a tax return or what the outside auditor actually does before deciding the financial statements accurately reflect what’s been going on. A good director isn’t necessarily a whiz with financial statements. Rather, it’s someone with a willingness to ask questions. One idea of hers is to have candidates ask about the relationship between the board and executive director, particularly the executive director and whoever chairs the board. It’s possible for the board chair and the executive director to be too chummy, for example, with the rest of the directors struggling to have any influence. Another common sense thing Stone suggested was making sure any candidate asks why he or she is being recruited. If it’s a personal friend doing the asking, and friendship seems to be the primary qualification, then maybe say no. A couple of well-timed questions from a board member might have been all it took to change the direction at a school technology nonprofit called TIES. The Falcon Heights-based nonprofit was one of the cases of mismanagement in the news this year, and the forensic accounting report disclosed this fall, by the accounting firm Kern DeWenter Viere, is two dozen pages of sobering reading. One small section that stands out is when KDV discusses a letter TIES received from Malloy, Montague, Karnowski, Radosevich & Co., TIES’s outside audit firm. This firm was letting TIES know it didn’t want to bid for the audit work anymore, citing a bunch of concerns about the accounting at TIES. The Malloy firm’s letter was received May 15, 2002. More than 12 years of board meetings came and went since TIES got that letter, and then TIES landed on the front page when KDV detailed some of the very failings that the former auditor had pointed out 12 years ago. Back in 2002 somebody on the board needed to speak up. Apply some common sense. We need an auditor, right? And our auditor doesn’t want to do it anymore? Why? Time for a complaint to the FCC, this is too serious to go unreported. Here’s the FCC Complaint page, scroll down to “TV File Complaint” and hold WBFF Baltimore accountable. What’s at issue? WBFF Fox 45 in Baltimore both edited a protest chant and said in a voiceover that the protesters were saying “so kill the cops.” And that’s a lie. And no, it’s not an innocent one. I’ve done a few years in radio, know about editing, and the chant was repeated and repeated, and they had to work to falsely report it, both in editing of the chant, and in the voiceover. Innocent mistake? NO! WRONG! It wasn’t just once, but TWICE! Someone had to edit it and someone else did the voiceover, and I’d guess that someone else told them both how to do it and what words to use. The WBFF Fox 45 embedded code doesn’t work, so here’s THEIR PAGE ON THIS AND “APOLOGY”, and their link to the WBFF interview: Fox 45 interviews Tawanda Jones . There’s a comment section — be sure to tell them what you think! WBFF stresses that this was an “HONEST error” (emphasis is theirs) but as Tawanda Jones notes, how is that possible? The chant was repeated over and over and over. They did a voiceover. Tawanda Jones, I hope you’re shopping for a heavy hitting attorney to sue them and shut this down. Last night on Fox45 News at Ten we aired a story regarding the increased risk in being a police officer in light of recent grand jury rulings and the shooting deaths of two police officers in New York City. We aired part of a protest covered by CSPAN that appeared to have protesters chanting “kill a cop”. We spoke to the person in the video today and she told us that is not what she was chanting. Indeed, Tawanda Jones, says she was chanting, “We won’t stop ‘til killer cops are in cell blocks”. We invited Tawanda to appear on Fox45 News at 5:00 and Fox45 News at Ten tonight for an interview so we can discuss the video and the recent violence in New York City. She has kindly accepted and we will bring you that tonight. That’s not adequate. When they’ve reported such inflammatory lies, how can something like that ever be retracted? Something like this, particularly because the false notion that protestors are wanting to “kill cops” has to be loudly and publicly stopped, with strong action by the public and regulators, with monitoring and correcting each and every instance that protesters are branded, and a lawsuit or two by every protester falsely “quoted” and labeled. SHAME! This is false propaganda, abuse of media power at its worst. Capitalism happens… and sometimes it doesn’t! 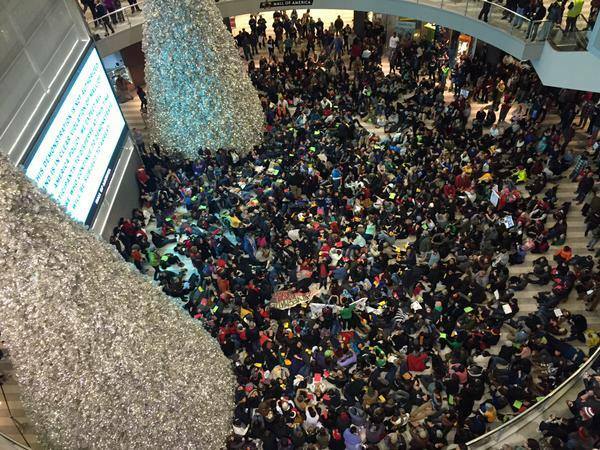 Big thanks to everyone who posted photos of yesterday’s action at the MOA. 3,000 or so Minnesotans showed up to demand accountability, professionalism, and basic civil rights — that BLACK LIVES MATTER. ALL LIVES MATTER! And it’s in the New York Times! The MOA issued a letter saying that protesters were not to be allowed inside, that they would be restricted to a certain part of a remote parking lot. Bloomington police, MOA and other security were there, looking like they’d just stopped off from the RNC wardrobe warehouse, full riot gear. But that didn’t stop the group from gathering in the mall. They took over the rotunda, and surrounding balconies, and shut it down for a while. YES! Because part of the problem here is that capitalism gets in the way of democracy, so it’s appropriate that one of the biggest shopping days of the year is brought to a screeching halt. A very diverse crowd including a group of Universalist pastors were on hand, a die-in here and there. Demonstrators were joined by shoppers and workers, some of whom were pushed back into a store and the gate slammed down (!). This IS what democracy looks like. So while you sit there, sympathizing with the criminals and becoming part of the problem by saying, “Hands up, don’t shoot” or “I can’t breathe” and preaching an ignorant and biased agenda against an individual who would willingly die for you in an instant, no matter if you like them or not; while you sit there with hate and distaste over the fact that they are “all racist” and they can hide behind the badge and without mercy, murder anyone they please-while you sit there and bask in all the hatred that has been ignited this past year, understand that they will ALWAYS be there to help you. Consider these numbers. Let’s dedicate ourselves to ending the smoke-and-mirrors game. The measure that is used to determine the volatility of flammable liquids is called RVP — Reid vapor pressure. The new North Dakota law that will go into effect on April 1 will set the limit on Bakken oil to no more than 13.7 RVP pounds per square inch (psi). • Crude oil from the Gulf of Mexico has a RVP psi of approximately 3. 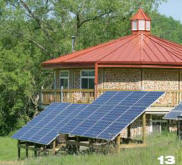 • For crude oil from the Eagle Ford shale formation in Texas, that number is approximately 8. • For gasoline, it’s approximately 9. • The Lac-Mégantic oil-train explosion in Quebec had a tested RVP psi just above 9. • Bakken crude oil typically has a RVP psi between 11.5 and 11.8. The bottom line is that the limit has been set so high by North Dakota that the mandate is toothless. The same volatile oil that caused the massive explosions in Casselton, N.D., and Lac-Mégantic would still have been allowed to ride the rails, according to this new mandate. Of course, the petroleum industry has been protesting that the problem isn’t with the oil, it’s with the railroads. Although there is some truth to the fact that railroads should share in the blame, let’s also not forget it’s the petroleum industry that leases the DOT-111 tank cars that ride the rails. The National Transportation Safety Board has stated numerous times that the DOT-111 tank cars hauling hazardous materials either need to be seriously upgraded or pulled from service completely. Currently, the U.S. Department of Transportation is considering new rules to phase out some of the DOT-111s by 2020, but that only applies to trains hauling 20 or more of these tank cars. All others will be allowed to stay in service indefinitely. So how much oil travels through Minnesota per day on these deficient DOT-111s? From records released this year, we know that approximately 50 oil unit trains pass through Minnesota on a weekly basis. To put this into perspective, that’s about seven oil trains per day. That’s about 500,000 barrels of oil per day via rail. Currently, the Enbridge Alberta Clipper pipeline carries about 450,000 barrels per day. For all practical purposes, we have a rail pipeline passing through our state — and research has shown that, on a per-mile basis, the accident rate is 3 to 3.5 times higher by rail vs. pipeline. It’s time to stop this smoke-and-mirrors game. We need the petroleum and rail industries, along with our legislators, to meaningfully reduce the volatility of Bakken oil and to remove from service DOT-111 tank cars that carry all hazardous materials, not just the oil in trains with 20 or more cars. Doing anything less is continuing to put our citizens and environment at great risk. Alan Stankevitz lives in La Crescent, Minn. His website “The DOT-111 Reader” (http://dot111.info) is a clearinghouse for information related to DOT-111 tank cars and subjects related to shipping crude oil via rail. The explosion risk still exists, which emboldens pipeline supporters — but why must our choices be so dismal? A large swath of Lac-Mégantic, Quebec, was destroyed and 47 people were killed in July 2013 when a train carrying Bakken crude oil derailed, sparking several explosions and forcing the evacuation of up to 1,000 people. I’ve seen Bakken crude oil as it comes out of the ground. It was surprising in several ways: It was almost green, quite fluid and downright fizzy with natural gases. It’s the high gas content that makes Bakken shale oil so explosive. When the state of North Dakota established new limits on vapor pressure last week for the oil shipped out of the state, my first reaction was relief. Flammable liquids with lower vapor pressures are less volatile. We’ve seen several explosive rail accidents in recent years involving Bakken oil; an oil train derailment last year in the small Quebec town of Lac-Mégantic killed 47 people and flattened its downtown. I was pleased that regulators were addressing this problem. But when I took a closer look at the numbers, I felt more dismay than relief. Even if oil producers exceed the regulators’ demands — and regulators say they often do — Bakken crude will still be explosive. The appropriate comparison seems to be gasoline. Lynn Helms, head of the North Dakota Department of Mineral Resources, said the new vapor pressure standard of 13.7 pounds per square inch (psi) would make Bakken crude no more volatile than the gasoline we put in our cars every day. In March, an investigation by the Transportation Safety Board of Canada concluded that the Bakken oil in rail cars at Lac-Mégantic was “as volatile as gasoline,” but the vapor pressure was measured at 9 to around 9.5 psi. In other words, the Bakken crude that exploded in Lac-Mégantic was less volatile than what North Dakota regulators are demanding now, and it still exploded. In a New York Times article last week, Clifford Krauss reported: “Once the rules are in force early next year, transported North Dakota crude oil will have a similar volatility to that of automobile gasoline, which should decrease the risk and size of any fire that might occur once a rail car is punctured in an accident, according to state regulators.” His story never mentioned the findings of the Canadian government. Why wasn’t this New York Times reporter more skeptical of the assurances of North Dakota oil regulators, especially after the recent New York Times revelations about the leniency of regulators toward the oil industry? The new vapor pressure standard announced last week is pointless. We will still face danger from exploding oil trains. This disturbing fact tends to encourage pipeline supporters. Pipelines are safer, they say. In the past, oil transported by pipelines has tended not to explode and kill people; instead it spills and contaminates streams, lakes and aquifers. If you value people’s lives over clean water supply, in the short term, pipelines seem better. But why do we have to make such lousy choices to keep our domestic energy boom rolling — to keep workers working and our dream of energy independence alive? Let’s do everything we can to encourage the other domestic energy boom, the wind and solar boom, that has already begun and that survives today despite many obstacles, including national policies that still encourage fossil fuel, yesterday’s energy source. If we were to place a price on carbon tomorrow, we would not need as many pipelines and we would be able to reduce the number of oil trains passing through our neighborhoods. Climate experts urge us to leave much of the world’s remaining fossil fuel, including Bakken crude, in the ground. If we do as they advise, we will disrupt job markets and be forced to rethink the way we do almost everything. Why should we voluntarily face such disruption? One very good reason: We already face the prospect of pervasive disruption posed by a changing climate. It’s far preferable to take well-designed and systematic measures to control disruption than let disruption control us. Lisa Westberg Peters is the author of “Fractured Land: The Price of Inheriting Oil” (Minnesota Historical Society Press, 2014). She lives in Minneapolis with her family.